Because both 1999’s The Phantom Menace and 2002’s Attack of the Clones received so many negative reactions, folks tend to forget the moderately lukewarm reception to 1983’s Return of the Jedi. To be sure, many people really liked Jedi and it certainly raked in lots of money. As with predecessors Star Wars and The Empire Strikes Back, Jedi was its year’s biggest-grossing movie. Really, the sense of fun is what keeps Jedi going. Of all the three flicks in the Original Trilogy, it definitely stresses action the most heavily. This comes at the expense of character and story development, as Jedi displays the cartooniest exploration of its story. That comes as a particular disappointment after the relative depth of Empire, and it fares poorly even in comparison to the character delineation of Star Wars. Given the issues that affect the main personalities, the way it gives their growth the short shrift seems bothersome. Many others disagree, but I definitely prefer the DVD’s ending song to the old Ewok “Yub Yub” number from the original movie. Although I never developed a real dislike for the Ewoks, I did always hate that damned tune, and the newer one gives the film a more melancholy and emotional conclusion. It’s not a great number but it certainly betters “Yub Yub”. As for the Dolby Digital EX 5.1 soundtrack, it felt like a virtual clone of Empire’s audio in terms of scope, quality and consistency. Star Wars had more than a few erratic moments, but its two successors maintained a high degree of stability. The soundfield once again created a full and involving setting. Music featured concise and broad stereo imaging, while effects spread convincingly across the five speakers. As usual, space flight scenes used the channels to the greatest advantage, as the crafts flew and zipped around the room well. Other segments also brought the mix to life. Elements were logically placed and connected cleanly to create a detailed soundscape. Note that this presentation of Star Wars exactly duplicates what we found on the 2004 DVD release. 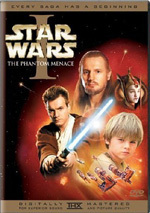 Disc One of this package is identical to that set’s Jedi DVD. No changes in picture or audio quality occur here. 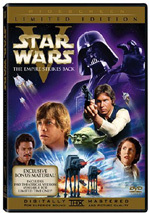 That also means it includes all of the same extras, starting with an audio commentary from story writer/producer George Lucas, sound designer Ben Burtt, visual effects supervisor Dennis Muren, and actor Carrie Fisher. All four were taped separately for this edited track. As they discuss the final chapter of the trilogy, technical issues dominate. Lucas talks about the ways the series used and broadened those elements and also goes over issues connected to the challenges presented by the tale’s final chapter. Lucas spends some time on story concerns and character developments. Of much greater interest to fans – and the only reason most people will buy this release – is the original theatrical version of Return of the Jedi. That’s right – we get the flick as presented in 1983. Since I already went over the changes made for the special edition, I won’t detail those alterations here. Instead I’ll focus on the quality of the presentation. Return of the Jedi appears in an aspect ratio of approximately 2.35:1 on this single-sided, dual-layered disc; as most folks already know, it hasn’t been enhanced for anamorphic TVs. This is the same transfer created for a 1993 laserdisc set, and it shows its age. Actually, it offered arguably the strongest visuals of the three movies in most ways. The weakest link came from shadowy shots. Although Empire offered the chapter with the darkest emotional tone, Jedi presented the darkest transfer. This was especially evident during the many indoor shots in the flick’s first half. From Jabba’s palace to his sail barge to Yoda’s pad to spaceship interiors, these sequences consistently appeared murky and too dense. Blacks were inky and somewhat flat, another reason the low-light bits lacked definition. Even exteriors could become tough to discern. For instance, the frog-like creature outside of Jabba’s palace was almost impossible to see. With all the vivid Endor shots in the movie’s second half, matters improved, but all these muddy elements made much of the film difficult to watch. The rest of the transfer was reasonably successful, though. Sharpness remained consistent with Empire. The movie rarely seemed particularly concise, but it also wasn’t terribly soft, either. The lack of anamorphic enhancement meant we got good but unexceptional definition throughout the film. As with Empire, jagged edges and shimmering were minor; those elements created many distractions during Star Wars, so I was glad to see them decrease substantially during the two sequels. Colors seemed pretty good here. Jedi was always the Original Trilogy movie with the most dynamic palette, and the colors usually came across as fairly lively and broad. Only those dark sequences occasionally lessened the impact of the tones. Source flaws were relatively insubstantial as well. As with Empire, bouts of specks and other marks occasionally appeared, but these were noticeable fewer than during Star Wars. All in all, the highs and lows of the transfer left it with a “C+”. Matters improved significantly when I examined the Dolby Surround 2.0 soundtrack of Jedi. As was the case with Empire, the original audio held up nicely when compared to the remixed 5.1 track. In this instance, the newer audio worked better due to a broader soundfield. I didn’t sense a great amount of expansion when I compared the two Empire soundscapes, but the 5.1 Jedi used the surrounds to a noticeably more impressive degree. For the 2.0 Jedi, the forward channels dominated and worked tremendously well; they compared very favorably to the front speakers in the remix. However, the old track didn’t boast as much activity from the surrounds. They still added nice zip to the presentation, but they were a bit more passive than I expected. The 2.0 Empire lost some points in regard to audio quality, but I found little about which to complain when I listened to the 2.0 Jedi. The material sounded quite good and betrayed few flaws. Only a smidgen of edginess or brittleness affected any of the high-end components, and low-end was deep and surprisingly firm. The track didn’t seem quite as full as its cleaned-up 5.1 counterpart, but it held its own without much trouble. Add this together and the 2.0 Jedi deserved a “B+” just like Empire. Although Return of the Jedi stands as the weakest of the Star Wars “Original Trilogy”, don’t take that as a severe criticism. Yeah, the movie occasionally seems silly and immature, but it packs a lot of entertainment and finishes the series on a satisfying note. The DVD gives us stellar picture quality, terrific audio, a pretty useful audio commentary and the flick’s original theatrical cut. I really like Jedi and I definitely recommend it as a fun conclusion to the trilogy. 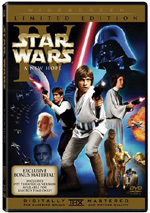 Recommendations become affected by the fact this “Limited Edition” of Jedi stands as the movie’s third DVD release. 2004 gave us the deluxe three-movie set, while 2005 produced a bare-bones version that lacked the prior package’s bonus disc. 2006 presents the initial individual release of Jedi, and also includes its theatrical cut for the first time on DVD. That means the LE of Jedi will be great for those who want to own it and it alone. I can’t imagine too many folks will desire to possess Jedi but not the other two, so this should be a limited audience. I think the vast majority will prefer one of the two boxed sets so they can have all of the movies. Other than the precious few who only like Jedi, this LE will appeal solely to completist nerds such as myself who want a DVD rendition of the flick’s 1983 theatrical cut. I much prefer the 1977 Star Wars to its SE edition, while both Empire versions are fine with me. Jedi is more of a toss-up; some parts of the original are better, while aspects of the SE seem stronger. In truth, I prefer the SE by a slight margin. Nonetheless, I’m glad to own the 1983 cut on DVD. I’ll probably never watch it again, though – at least not until and unless Lucasfilm gets off their butts and gives us a nice new anamorphic transfer for it. The SE looks and sounds better than the non-anamorphic Jedi, so it’s the one I’ll check out in the future. Leave this lackluster Limited Edition to obsessive fans.